Promenade residential development located in Parramatta in Sydney's West. 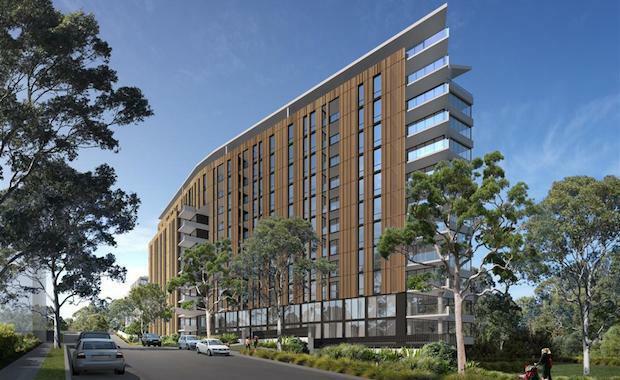 The new 12-storey building will contain 153 one, two and three bedroom apartments on the northern bank of the Parramatta River, with prices starting from $440,000. Promenade‘s first two buildings comprising of 124 apartments, sold out on the launch weekend in May 2014, with the majority of apartments selling in just hours. Both of these buildings are now under construction with completion in late 2016. Savills Residential is expecting great interest from both owner occupiers and investors, replicating sales in the first two buildings. "There were a lot of young couples making their first property purchase., knowing that this development will provide a healthy lifestyle in which to raise their family, close to quality schools, universities and hospitals. For business people the close proximity to transport, dining, shopping and recreational facilities were influencing factors," said Irene Lau, a Director of Savills Residential Projects. Apartments in Building Three will feature high ceilings and generous balconies or courtyards with glass balustrades. Starryland Australia is a local division of the publicly-listed Fuxing Huiyu Real Estate Company Ltd, which develops more than one million square metres of property per year in China. The Promenade project is its first foray into Sydney. “Promenade is a landmark development for Western Sydney and has established our developer credentials in Australia,” said James Swete, the Sales and Marketing Director for Starryland Australia. On completion Promenade will have 1.2 hectares of landscaped foreshore open space, a pedestrian bridge across the river, an extensive walking and cycling network.